Inflammation is your body’s natural response to put out fires. It is your immune system at work, doing its best to protect and heal you. When you stub your toe or cut yourself, for example, the area becomes inflamed as various workers in your body attempt to stabilize the situation, clean it, and limit the spread of infection. Inflammation also occurs where you can’t see it, inside your cells, blood vessels, and other areas. When it happens for too long, it becomes a problem. People with cancer, diabetes, heart disease, and other chronic conditions often experience chronic inflammation. Their immune system is constantly in overdrive, to the point where it becomes damaging to their cells. Inflammation spreads, so if, say, an area inside you becomes inflamed, that inflammation can spread as it responds to the inflammation that is already occurring. Obesity and poor health can contribute greatly to inflammation, but inflammation can be reduced through weight loss and eating foods that have anti-inflammatory properties. Including omega-3 fatty acids in your diet can help improve your cholesterol profile by improving your HDL/LDL cholesterol ratio. Having high levels of “bad” (LDL) cholesterol can contribute to inflammation of the cardiovascular system, depositing on artery walls making it more difficult for blood to travel through your arteries. HDL cholesterol, on the other hand, works to clear space in the arteries by removing LDL deposits. Omega-3’s effects on your cholesterol ratio are very important in lowering inflammation. Foods that are rich in omega-3 fatty acids include fatty fish, like salmon and mackerel. You want to get a good helping of DHA, so including fish in your diet a few times a week or taking a fish oil supplement can be of great benefit. Olive oil is another healthy fat source that can be an effective way to reduce inflammation. There is a compound in olive oil called oleocanthal that prevents inflammatory enzymes. Some studies have found it works as well as anti-inflammatory medications, like ibuprofen and “Aspirin” (acetaminophen), so if you can include olive oil in your daily diet, you might be able to prevent inflammation. Olive oil plays a big role in the Mediterranean diet, which is known to lower a number of health risks that lead to inflammation. Foods that are rich in antioxidants can help fight inflammation by keeping your cells healthy. Having a diet rich in fruits and vegetables is the best way to ensure you’re getting adequate amounts of antioxidants. Some of these foods are also full of additional nutrients that fight inflammation and the conditions that cause it. Herbs and spices have also been found to possess anti-inflammatory properties. Turmeric (curcumin) can lower inflammation, as can ginger, cinnamon, garlic, cayenne, and black pepper. Adding a dash of spice to your food or some cinnamon to your coffee or tea can help promote improved blood flow, while fighting inflammation and improving your overall health. Green tea has a number of health benefits, including positive effects on metabolism, cellular strength, and general health. Green tea is rich in antioxidants like ECGC and polyphenols like flavonoids and catechins. The healthful compounds in green tea are associated with lower risks for certain cancers, type 2 diabetes, obesity, cardiovascular disease, and other conditions that can contribute to chronic inflammation. When you stub your toe, sprain your ankle, or cut yourself, taking an anti-inflammatory to limit swelling can be of benefit. These treatments for acute, short-term inflammation are good for dealing with short-term inflammation and pain. Of course, you can use ice, rest, and the foods mentioned above to limit the effects, but short-term inflammation is usually little to worry about. It’s a temporary, time-sensitive response to injury. Chronic inflammation, however, is quite different. Infection, allergies, cell damage, or other issues typically cause chronic inflammation. Heart disease, body weight, cholesterol, and blood pressure all play a role in chronic inflammation, so eating a healthy diet with nutritious whole foods is really the best way to fight back. And the benefits to eating these foods are countless, as they can help to reduce your weight, control your blood pressure, and lower your risk for diabetes and heart disease, in addition to fighting inflammation. “Omega 3 Fatty Acids,” University of Maryland Medical Center web site, June 24, 2013; http://umm.edu/health/medical/altmed/supplement/omega3-fatty-acids, last accessed March 19, 2015. 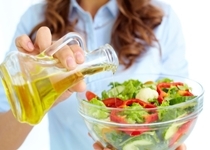 Chappell, M., “Olive Oil Reduces Inflammation,” Arthritis Foundation web site; http://www.arthritistoday.org/what-you-can-do/eating-well/arthritis-diet/olive-oil-inflammation.php, last accessed March 19, 2015. Akhtar, N. and Haqqi, T.M., “Current nutraceuticals in the management of osteoarthritis: a review,” Therapeutic Advances in Musculoskeletal Disease June 2012; 4(3): 181–207, doi: 10.1177/1759720X11436238.